this is as it seems to me the unknown soldier mounament adjacent to the north side of the old parliament building, also where the Gen Daud road starts, i visited that place recently it is at the heart of the so called green line and it is total ruine. it is true it looks like that it is the monoment of the unknown soilder as siad barre have named it later but in this picture it looks that it is pre the unknown soilder, by which the italians made it for their heroes of subjugating the somalis. The memorial was designed by Cesare Biscarra (1866-1943). The monument was inaugurated on March 1, 1928 by the Governorin the presence of Crown Prince Umberto of Savoy. (1) dal 1930 il monumento non è più in faccia al mare ed è stato trasportato ai piedi della duna in fondo al Corso Vittorio Emanuele III. Il Lunomare Bottego voluto e chamato così dal primo Governatore fascista, ha pure mutato nome. I forgot: in my website on facebook (Paolo de Vecchi) I will put pictures of this monument. I will also put the original sketch of Caesare Biscarra. Of course you can copy it and put it here. The Monumento ai Caduti was erected in memory of Italian military explorers who had perished in Lafole. The explorers were led by Captain Antonio Cecchi, the Italian Consul in Zanzibar. The Captain and other Italian officers and sailors of gunboats Volturno and Staffetta were killed on November 26, 1896, by warriors of the Geledi Sultanate Clans in Lafole, Afgoi, 30 km south of Mogadiscio. In the mid Fifties, for us children of Bondheere the Monumento ai Caduti, at the foot of a hill and in front of Casa del Fascio, was a nice place to play. We called it “Molaminto”. 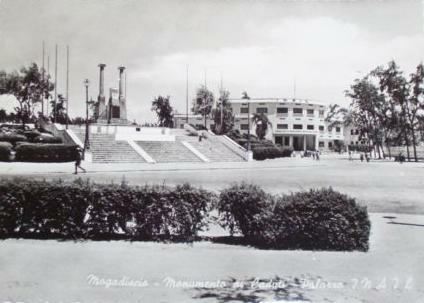 For the Italian inhabitants of Mogadiscio, it was a gathering point during religious festivities. Catholic people used to leave the nearby Cathedral led by “Monsignor Bishop”, whose mantle was lifted up by altar boys. Somalis, and mostly so we, the children, called the Bishop “Badari Buubaaye” the Flying Father, as we expected him to start flying at any time with his open mantle! 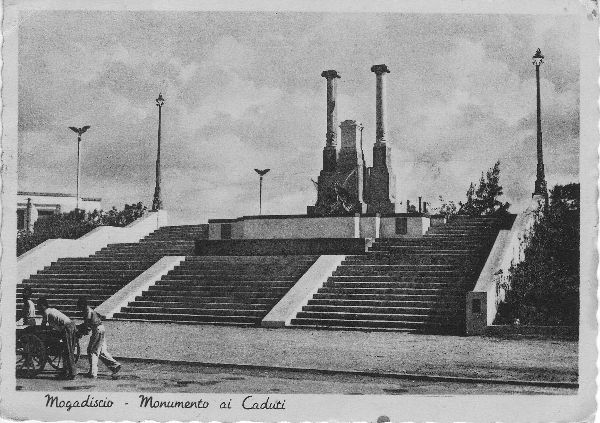 The Monumento ai Caduti was dismantled by Siyad Barre’s regime after the disastrous war between Somalia and Ethiopia, in order to build another memorial, to the Somali Unknown Soldier. The memorial marble of the Monumento ai Caduti, where the names of Captain Antonio Cecchi and his 16 Italian fellows were listed, was then transferred to the hill in front of the Italian Cemetery between Dhagaxtuur and the Forte Cecchi or Foorta Shiik, near the lighthouse. I disagree with Ahmed Sabri. The memorial was for all the Italians fallen in Somalia. All those dead until then and then also those Lafolé, but not limited to those. On the headstone were engraved the names of those who fell not only of the 17 fallen in Lafolé. I have a personal recollection of the Memorial and of the names of the military explorers, but you might be right.However, for sure the Governor Cesare Maria De Vecchi di Val Cismon, or the Crown Prince Umberto II in 1928, never mentioned the 70 Erithrean and Arab askaris perished or wounded with the 17 Italians at Lafolè. I recall seeing (in the 1980s) the remains of an Italian memorial in the old animal market in Wardhigley. In the hollow inland from Villa Somalia. Is there any connection here? It seems to me that someone wanted to know to whom this monument was dedicated. I do not think we were debating whether that monument was right or wrong. Reviews are not my responsibility! I can also give you a reason, but remember that since 1928 have passed, and not in vain, 83 years. Another world! Another way of thinking! However I do not want controversy, at least this is not the right place!